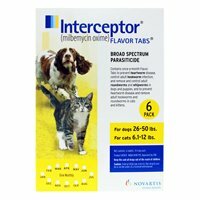 Interceptor Flavor Tabs are a palatable once-a-month tablet that prevents heartworm disease, controls adult hookworms, and removes and controls adult roundworms and whipworm infections in dogs.The easy to dose flavor tablet treats and prevents adult hookworms and eliminates whipworm and roundworm infection in dogs and puppies. The monthly oral medication kills immature form of the heartworm and protects dogs from dangerous heartworm infection. Suitable for dogs and puppies over 4 weeks of age weighing more than 2 pounds, Interceptor should be given monthly. The oral heartwormer is safe to use in pregnant and nursing dogs.